He spent his early years at Macy’s and Limited Brands where he moved from Operations to his first roles in Talent Management. Mark has been honored by The Society for Human Resource Management (SHRM) nationally as their Human Capital Leader of the Year in 2007, and by HR Executive Magazine as an Honor Roll recipient in 2010 and “Best HR Ideas” in 2012. 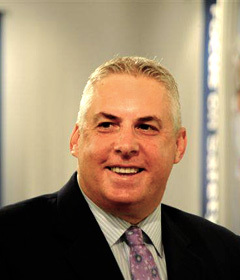 He has also been a recipient of SHRM’s Innovation in a Down Economy award in 2009, Adelphi University’s Teaching Excellence award in 2013, and named one of Long Island’s 50 Most Influential Business Leaders by Long Island Business News. His HR teams have garnished numerous national and local awards for HR innovation, wellness, and employee engagement. Mark speaks regularly at national conferences on topics ranging from E/R to Global HR. He is also an Adjunct Professor at Adelphi’s Graduate School of Business where he gets to give back to the next generation of industry leaders.